Tonight’s meal was rather unplanned, we went to visit Hafiq at the hospital and so since we were in the Pantai / Bangsar area, Chia Chen decided we should have something healthy, and for some reason she kept talking about Spinach Soup even to poor sick Hafiq and his family that she never met before, so we (Poh Leng and me) knew she was pretty serious about it. Getting there was easy and getting a park was easy enough. Looking for Country Farm Organics was something else. We walked all around and had to ask the guards where it was, we went out at every entrance of the complex only to find it right in front. So off we marched in and since we were the only third of fourth table that night and by far the biggest group, we were soon glancing through the menu to see what we could eat. I thought that the waitress was excellent at upselling. She could sell her stuff because she had good product knowledge, so she marketed her foods well. Any question I popped to her, being difficult and all, and she could give me a quick and truthful answer very quickly. 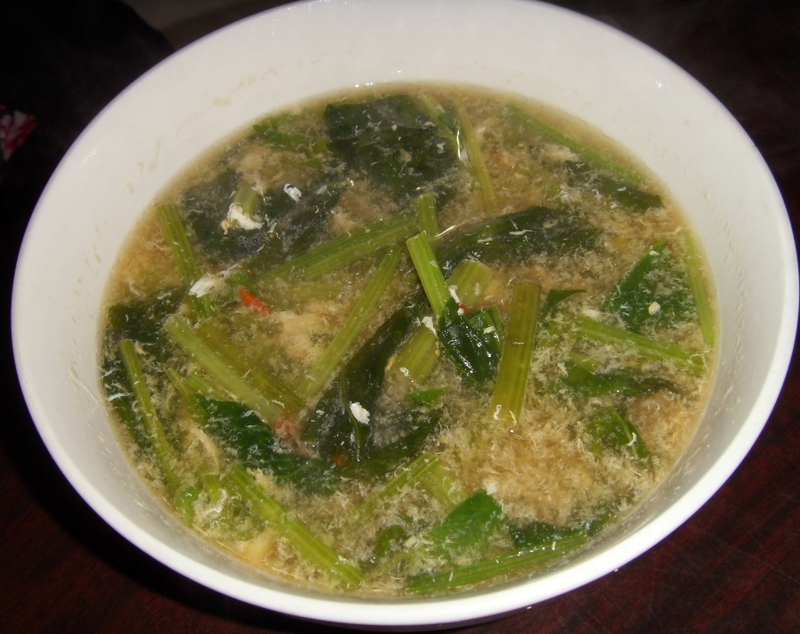 So for starters, no guesses what Chia Chen had… Organic Spinach Soup. 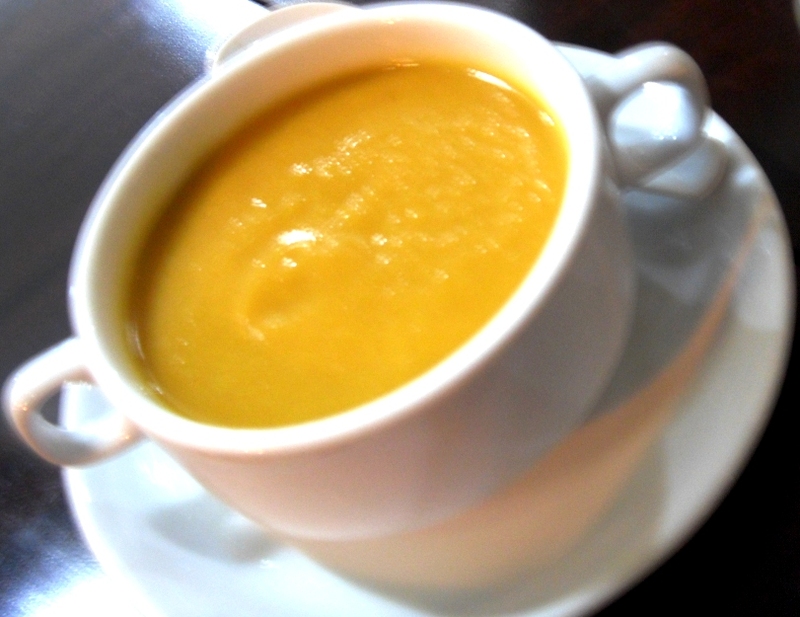 I had a Vegetable Tom Yum Soup and Poh Leng had Pumpkin Soup. 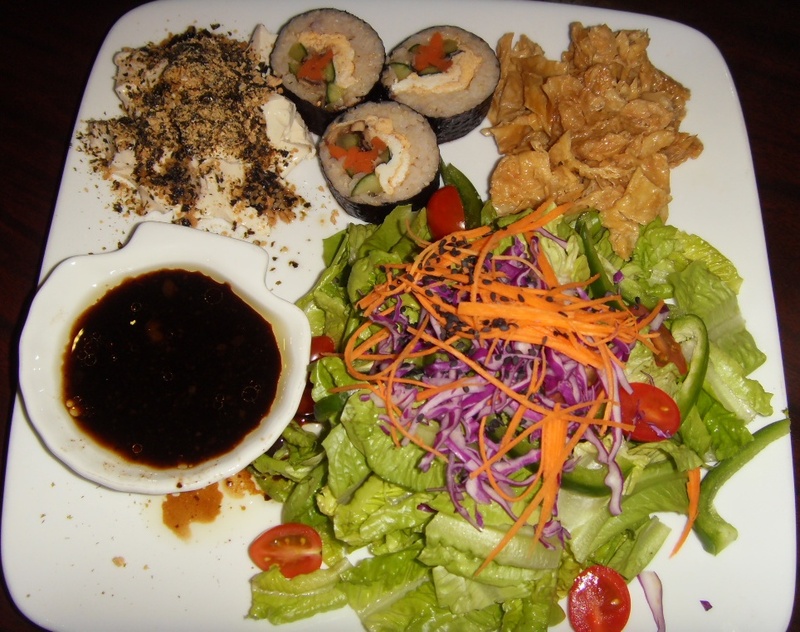 We also ordered our main courses, and so Chia Chen had Rice and Country Chicken Goulash, Poh Leng had a Grilled Fish with a pasta sauce, and I being the difficult one wanted something with tofu and something light and all and was told to try the Country Farm Special Salad with Sushi Rolls. In less then three minutes, our soups arrived. It was that quick! Chia Chen had a big family size bowl of Spinach Soup, and it was really nice. Homely and a kind of soup that is good on a nice cool night. I think it would be the perfect comfort food for a single person, because after a bowl of that, you’d feel really loved. Everyone liked it, perfect start to the meal. 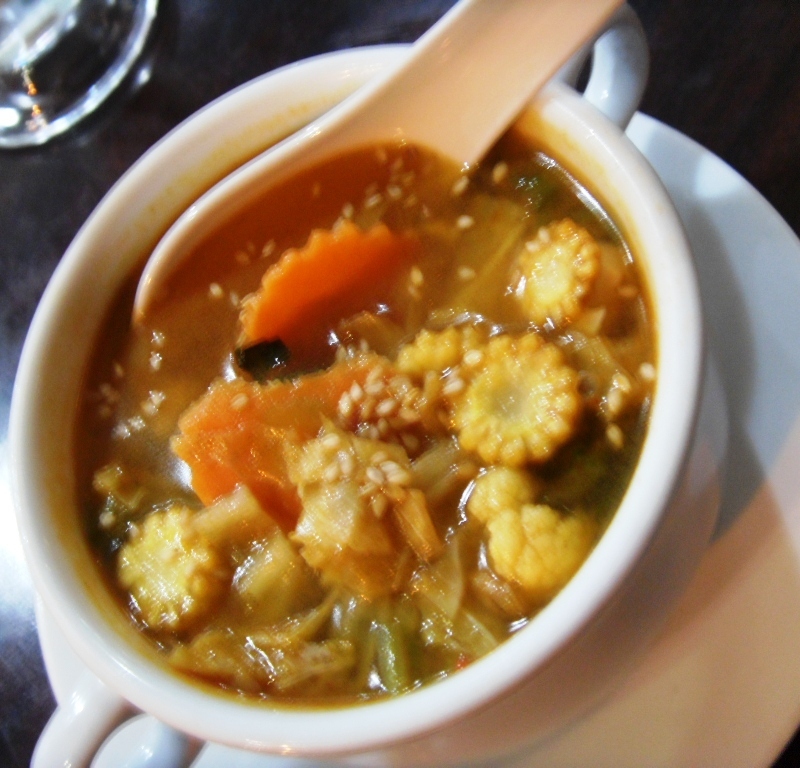 My Tom Yum Vegetable soup was also perfectly what I required, and with chockfuls of vegetables, it was wholesome and awesome to whet the appetite. It was not just floating vegetables but was jam packed with nicely cut bite size vegetables. Another loveable soup. Main Courses arrived by the third or fourth spoon of our soups. I did not understand what the rush was but there it was three main courses all pushed aside while we sat and had soup. I must say this rush was thoroughly unnecessary but there it was. Now let me start with my main course. I thought it was quite the work of art. The salad was colorful and artistically arranged. I think even a normal vegetable hater would have loved it just because it was arranged in a well thought off manner. The Sushi was made off brown rice. 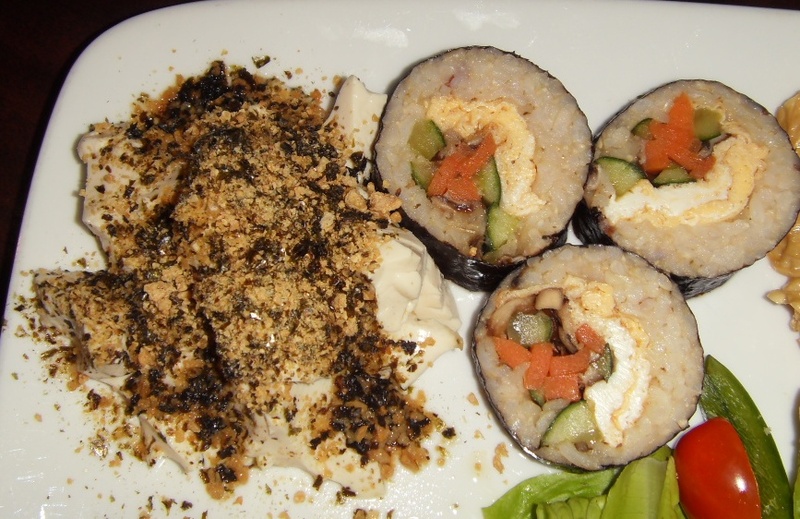 Now I have not tasted brown rice sushi before, although I have seen it a few times here and there but was never inclined to try it. My sushi was really nice. The combination of the egg, and the lightly pickled cucumber and carrot, and bits of I believe was mushroom was just perfect. I loved it. It would be something I could go back for although I am supposed to be on a carb free diet. I had Fu Chok which was blanched, and Fresh tofu with a wheat germ and chopped seaweed topping, and the dressing was another well thought of as it complemented everything on my plate. The dressing comprised off soy sauce, sesame oil, balsamic vinegar and probably a few other ingredient which I think I should have written down as I was eating. out is that the plate consisted of a lot of vegetables and there were no repeats. 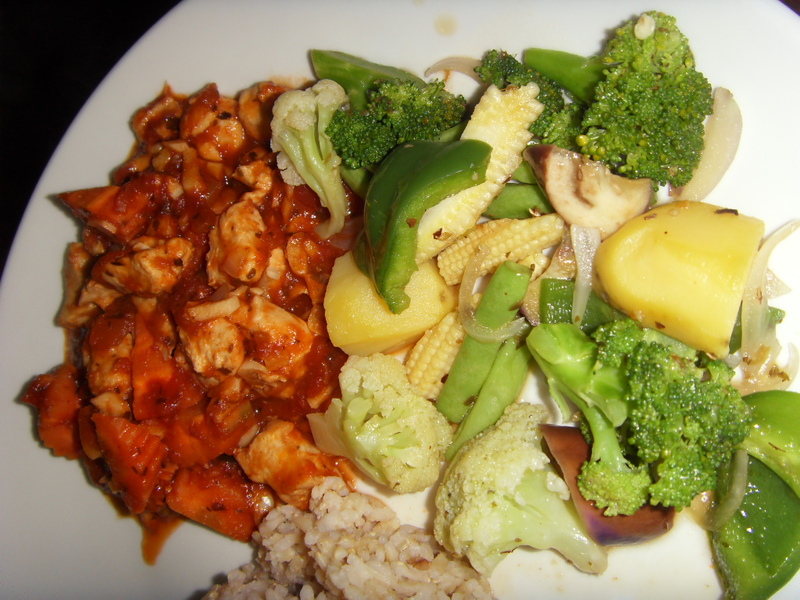 I thought that was pretty cool, because I have been to places where we everything is a set meal and similar vegetables cooked in different styles appears on the same plate. This was not the case. Taste wise I could get used to it. Now Poh Leng’s grilled fish was to me a downer. It was dull, it was insipid, it appearance wise it was not very appealing. Taste wise too, I thought it was rather simple and could have been improved. 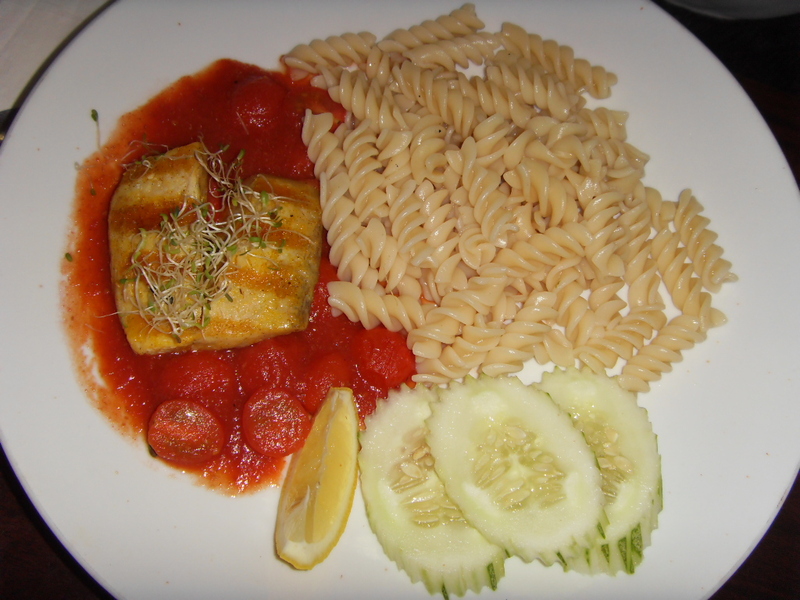 The tomato gravy was light and refreshing and the little not overcooked cherry tomatoes looked rather appealing, but I think the cucumber was somehow not necessary. Perhaps the chef should have steamed or pan seared some yellow squash, or even a leafy vegetable. This is just me. All in all, it was a good relaxing night. 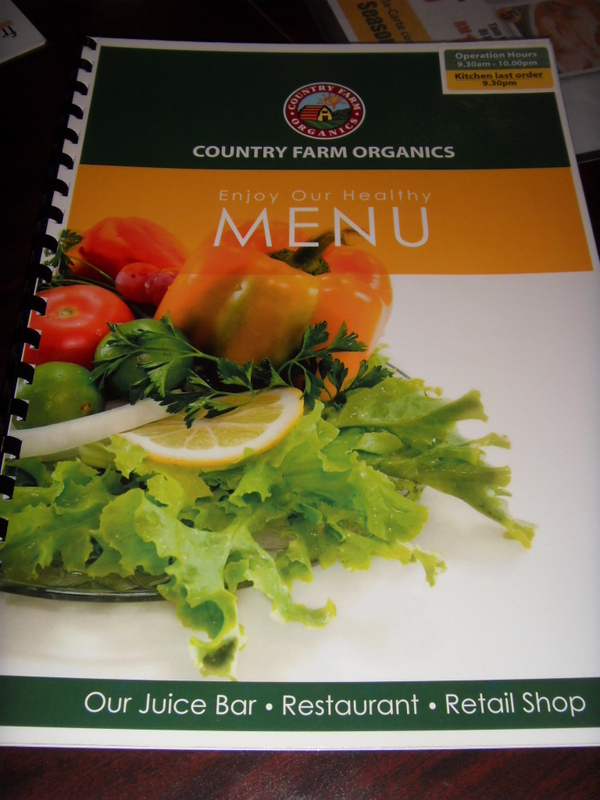 Food was nice and light, tasty in its own way, and since I am an advocate of healthy food and I have a whole recipe book of healthy recipes, I must say Country Farm Organics did do a good job. I did not have a chance to mosey around their retail shop, perhaps next time when I go there again. I will for sure. 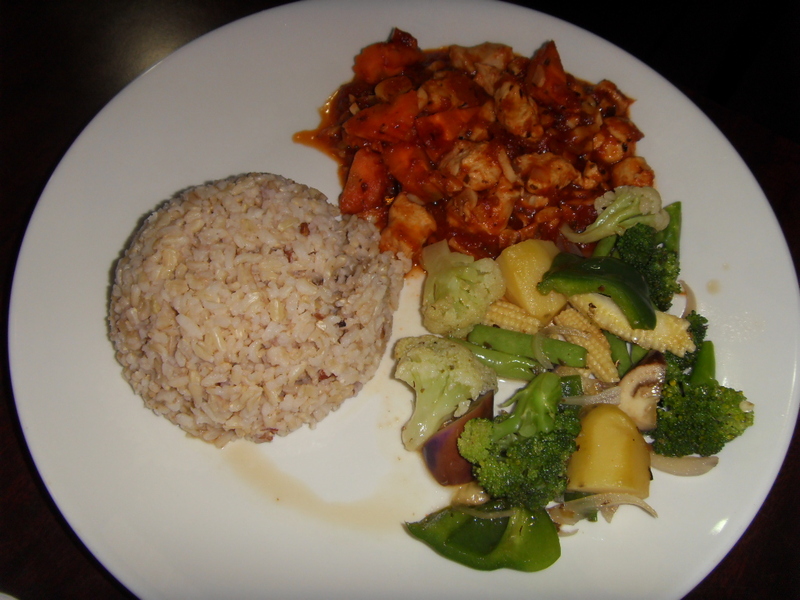 This entry was posted in Restaurant and Food Reviews and tagged Bangsar Shopping Village, Chef Nicholas Pillai, Country Chicken Goulash, Country Farm Organics, Good Home Style Food, Healthy Food, Nicholas Pillai, Non Oily and Creamy Food, Organic Food, Spinach Soup. Bookmark the permalink.